The relationship between music notation and the development of an effective system of music education has been clear since the earliest forms of written notation. Systems of notation in many cultures developed as a teaching aids rather than instructions to performers. In medieval Europe the development of notation had close educational links, revealed by the work of Guido of Arezzo in the eleventh century. Guido furthered the study of musical theory and notation in Micrologus (ca. 1025-28), which drew on theoretical studies of the ninth Century, Musica enchiriadis and Scolica enchiriadis, and from early Greek theory. Guidos’ developments were of a particularly practical nature, music being an important part of monastic education at the timei. Notation was primarily used to help singing students to learn and remember lines of melody. The ability to have these songs in written form would soon lead to more complex forms of polyphonic music, where musicians would sing independent parts as appose to the traditional unison singing of the early medieval period. By the end of the eleventh century, notation had developed that allowed for the consistent repetitions of musical works, which contained separate parts. With the evolution of notation, and the production of theoretical music books like the Musica enchiriadis, came the means to create ever more complex musical compositions. Advances in rhythmic notation gave composers like Leonin and Perotin opportunities to innovate, creating new forms and structures. Their work in the early Thirteenth Century developed ideas of harmony and counterpoint, which lead to ever more radical innovations in music composition. Notation would develop to give composers more control over every musical parameter. As a result the use and interpretation of notation became more and more specialised for both the composer and the performer. As composers became more adventurous in their composition and performers became more virtuosic in their technique, the division grew until specialized study was required in each area. As the development of notation created a clear division between composer and performer, it created an even larger division between those involved in creating music and those who consumed it. This distinction between 'musician' and 'non-musician', creator and consumer, is one that is still part of western musical culture and one that had a negative effect on music education since the introduction of systems of mass education in the mid to late 19th century. Although traditional notation is essential in the context of a specialised music school, it falls short in practical terms when used to teach introductory music to classes of mixed ability and musical experience. Reform in musical notation in the 1950's lead to many changes, both in the music itself and in the way it was being created. Graphic notation suggested a different relationship between the composer and the performer. Indeterminate notation systems would take control away from the composer and allow the musician more creative input. The interpretive and sometimes improvisatory role of the musician questioned the traditional ideas of musicianship and musicality. It also represented a search for alternatives to conventional harmony and traditional instrumentation. New notation was often used to create a collaborative relationship where the lines between composer and performer were blurred. Composers like John Cage, Cornelius Cardew and Earle Browne were relinquishing control over every detail of their composition and trusting the interpretation of the performer. For some composers this opened up the idea of democratisation of music. 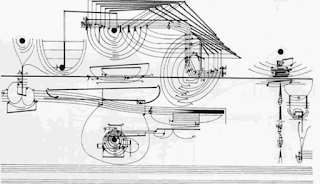 Graphic notation could allow composer to created pieces that anyone was free to interpret, regardless of their musical background or level of experience. It was this important change in attitude towards notation and musicianship that lead music educationalists of the 60's and 70's like Bernard Rands and George Self to experiment with new ways to explore music without using traditional musical notation. This new notation would allow them to explore, not only the basic concepts and building blocks of music, but also the new world of contemporary musical ideas. The crucial aim of developing the musical capabilities of all children, rather than a select group of children. The uniquely transcendental or transformative properties of music, including its aesthetic, emotional and spiritual qualities, which thus justify its imperative as a curriculum subject. The critical need for music teachers to direct their efforts towards artistic-musical rather than non-musical ends. Blacking talked of a society where music played a vital and functional role in creating a sense of community and of individual worth and belonging. From early childhood music is shared as a integral part of everyday life, not as a specialist subject taught in a formal setting. Part of the problem with music education in our primary level schools is the perception that music is a subject that cannot be attempted by a teacher without special training or vast musical experience. While most teachers will happily take an art class without having formal training in the use of watercolors, it is considered a more daunting task to teach a music class. This is a kind of musical inferiority complex that has been perpetuated through hundreds of years of composers, musicians, critics and scholars, working under the premise that music is at its most vital as a high art, presented by great artists. This paper will present an alternative view, that musical creation is too important to be left to a small minority and simply listened to by the vast majority . The true value in music is to be experienced by taking part. One of the most valued concepts in music education today is that every lesson should involve the active participation of the class, where the students ‘learn by doing’. Students should have experience in the three key areas of performing, listening and composing, as part of every class. These are known as the three streams of music education. Each stream is considered of equal importance in leading to a full understanding of any given musical concept, giving the student opportunities to grow their knowledge in a range of ways. Performing encourages confidence in a student’s personal ability and their ability to interact with others. Musical collaboration has been linked to the development of communication and interpersonal skills. The physical act of performing reinforces theoretical ideas, e.g. clapping syncopated rhythms reinforces the concept of syncopation. Listening is an important part of both music analysis and of group performances. Listening in the context of a group performance creates awareness and sensitivity to others in the ensemble and the individual’s role in the group. Critical listening is an important way for students to establish their own musical values. Composition gives the students an opportunity to explore newly learned musical ideas through a creative process. Through reinterpreting musical concepts they can gain a more in-depth insight and understanding of how they work. Regelski recommends that these sound compositions be employed on a regular basis as introductions or follow-ups to other musical lessons or as stand alone lessons in their own right, which expose students to ideas of contemporary composition. He supports the idea that ‘action learning’, which encourages students to be musically expressive is vital if they are to understand and appreciate the compositional process. This type of exercise requires careful planning ensuring that all students are actively involved. The recommended preparation includes division of the class into groups and suitable seating plan for the activity. Students can be involved in most of the compositional decisions of the piece but for practical reasons, basic rules must be set down. Regelski has compared these decisions made by the teacher to the questions often faced by contemporary composers. The idea of control is a major factor. These classes can be performed through free improvisation or they can be notated using a form of graphic notation. The latter option is more time consuming but offers more control and provides the students with a notation that they can use to compose their own sound compositions. George Self, Gregory Rose, David Bedford and Murray Schafer have written extensively on the subject and composed pieces specifically for classroom performances. Each of them employ some sort of graphic notation with text-based instructions, which not only give performance details but also suggest educational benefits of various aspects within the score for the benefit of teachers. In his piece for voice entitled Sound Patterns 3, Bernard Sands outlines, in the directions for performance, the many musical ideas the piece explores. The score uses a combination of graphic notation and written text which imply changes in dynamic, intensity, register and articulation. The performance instructions suggest that the class should be encouraged to invent more detailed manipulation of the texts through rehearsal, to be included in the final performance. This type of lesson not only develops the students’ understanding of a wide range of musical concepts but encourages an imaginative and creative approach to performance and composition. Unfortunately this type of music class is rare. Although the teacher is not required to have trained in conventional music notation they need to have the confidence in the material to present to the class. Although graphic notation can be used to make music classes more creative and engaging it is still seen as a specialist area of teaching that primary level teachers may find overwhelming. Graphic notation is therefore not enough to change the practice of music education. Further development of the notation and of they way it is presented is required. What's the solution? stay tuned for part 2 - The creation of a new notation for everyone!